I asked my butcher to butterfly and pound the beef tenderloin for me. Since it ended up being too long, I decided to make two rolls rather than one. The beef can be cooked sous-vide or in the oven. If cooking sous-vide, preheat your water bath to 55C/131F. If cooking in the oven, preheat your oven to 160C/325F. 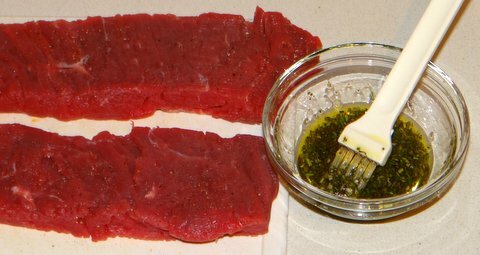 Spread out the beef tenderloin with the cut side up. Rub wilt salt and freshly ground black pepper. Mix 2 Tbsp extra virgin olive oil with the rosemary and garlic. Rub about half of the rosemary mixture on the beef. Cover with prosciutto and sprinkle with the freshly grated parmigiano. Heat butter and olive oil in a frying pan over high heat. Add the beef as soon as the butter foam retreats. Brown the beef on all sides and take it out of the pan. Take the pan off the heat. 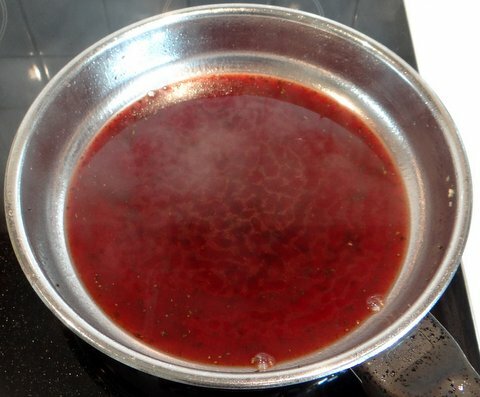 Pour the fat out of the frying pan and deglaze the pan with the red wine, marsala and beef stock. Scrape the tasty bits off the bottom with a wooden spatula. For cooking in the oven: insert the probe of a digital instant-read thermometer into the beef such that the tip is in the center of the beef. Return the beef to the pan and put the pan in the oven if it’s oven-proof. If it’s not oven-proof, put the beef and the pan juices into an oven proof dish. Roast in the oven until the thermometer reads 50C/120F, basting the beef now and then with the juices to prevent the beef from drying out. Let the beef rest for 10 minutes or so, covered with aluminum foil, until the thermometer indicates that the center has reached 55C/131F (around 10 minutes). 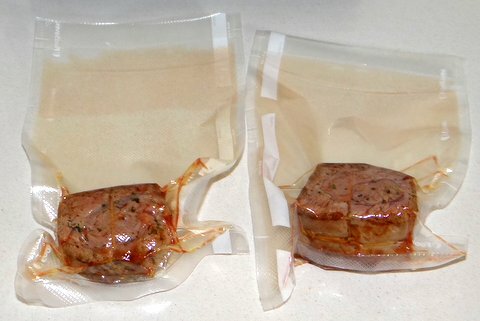 For cooking sous-vide: let the beef cool somewhat and seal it into a pouch. If you are using a clamp vacuum sealer (such as a FoodSaver), leave a long ‘sleeve’ of 10 cm/4 inches so the juice that gets sucked out of the beef does not enter the vacuum sealer. (This is the point to store the meat in the refrigerator if you’d like to serve it later.) Cook the beef sous-vide for 2-3 hours at 55C/131F. 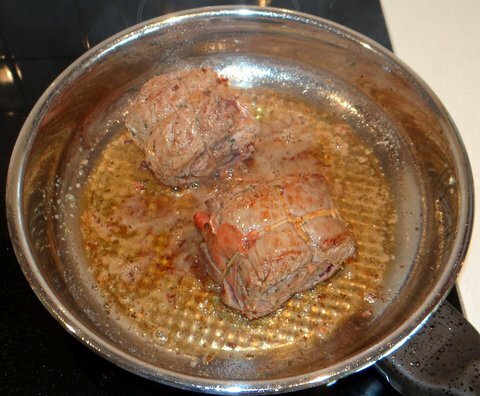 (A longer cooking time is needed if the diameter of the beef is more than 10 cm/4 inches. The cooking time is proportional to the diameter squared. 45 minutes for 5 cm/2 inches, 3 hours for 10 cm/4 inches, 12 hours for 20 cm/8 inches.) It is okay to leave the beef in the water bath a few hours longer, but not too long as the beef might become mushy. Let the pan juices thicken over low heat to make the sauce while the beef is cooking sous-vide. 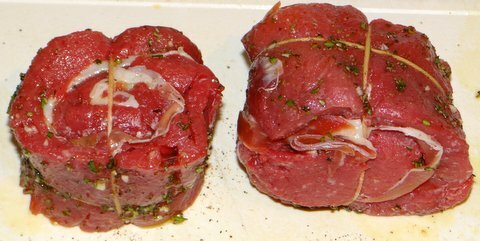 Slice the beef into 1 cm/0.5 inch slices and serve on preheated plates with the sauce. (Since the temperature of the beef is only 55C/131F, using preheated plates is important!) Great with spinach, stirfried with garlic. Mix some of the sauce with the spinach to make the spinach taste even better with the meat. This complex elegant dish goes well with complex elegant red Italian wines such as Barolo. A Barolo that is a bit too tannic by itself will appear much smoother if eaten together with this dish. Since this dish comes from the region of Emilia-Romagna, an aged Sangiovese di Romagna Riserva would also be an excellent choice. Why did you brown the meat first for sous vide? May we do it afterward, on the grill? 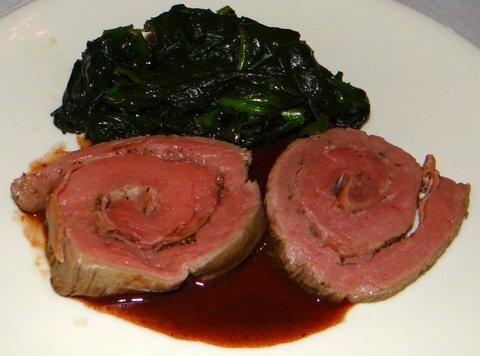 We are cooking rib-eye cap steak which is rolled in a similar manner. Thanks! You could brown it before or after. I have done both. The advantage of browning before is less steps to serve (when you have guests). When browning after, make sure you allow the meat to cool a bit first, as otherwise the grilling will overcook it because the core of the meat is already at the right temperature. Thanks for your help. I browned it first….we were more than pleased with our first try! So tender and juicy. Can’t wait to try something else! Hi Linda, you are welcome. Was this your first trial with sous-vide? Sous-vide is wonderful, isn’t it? I’ve had mine for over five years now, and four years of my experience with cooking sous-vide has been documented on my blog. So there is plenty of information and recipes for you to find. Please do not hesitate however, to ask any questions you may run into.